The Island Summer Massive will be August 26th with the smoothest island vibes all the way from New Zealand, THREE HOUSES DOWN. Sharing the love and Aloha from across all of Polynesia with Na Drua, Siaosi and many more guest appearances! UPDATE: This event has been changed to a 21+ only event. 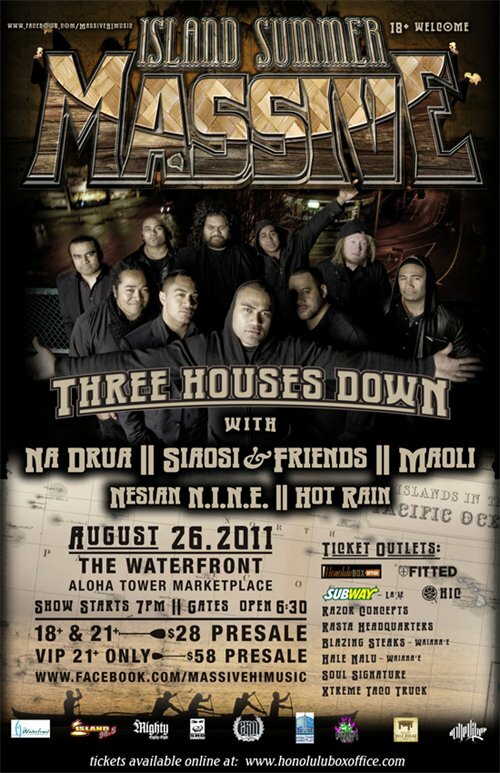 Please contact Honolulubox.com if you have purchased 18+ tickets. Mahalo for your understanding! 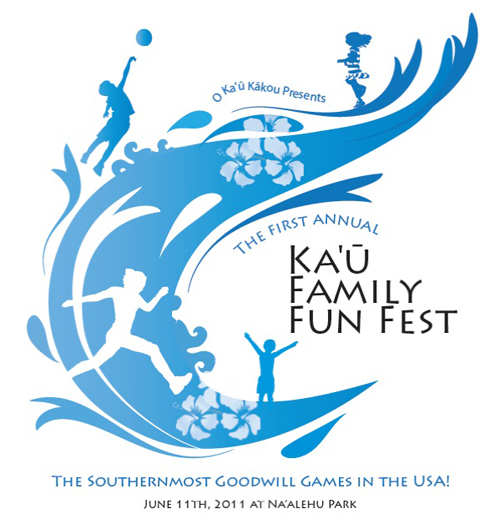 O Ka’u Kakou proudly announces the first annual Ka’u Family Fun Fest on Saturday, June 11, 2011 at Na’alehu Park on Hawai’i Island. Online registration and event details are now available at race360.com/15811. Early registration ends May 11, 2011 (today) with the next registration deadline being set for May 31st where entry fees will be raised on a tiered fee schedule. The Half Marathon fee before May 11th is $45, before May 31st will be $50, before June 10th will be $55, and on June 11th will be raised to $60. The other races and tournaments have similar price increases on each deadline. Event information and updates can be found at okaukakou.com, bayclinic.org , on Facebook (Kau Family Fun Fest) and Twitter (@KauFamFunFest). The Ka’u Family Fun Fest will be marketed heavily both locally and internationally, offering significant media exposure for participating sponsors and community leaders. Contact race director Raylene Moses at (808) 235-8251 or kaufamilyfunfest [at] gmail.com for information on volunteer, sponsorship and vendor opportunities. Pacific Roller Derby invites fans to witness a smorgasbord of rollergirls dressed as Cavegirls and Ravegirls in a colorful scrimmage in the ‘cage’ at the USCG Hideaway Club at Barber’s Point at 4pm this Saturday, May 14. The league’s veteran skaters welcome the newest derby girls as they make their debut on the flat-track. Adair Ya-To!, Lil’ Red Righthook, Charm School Her, Prett E. Solid, Miss Behavin’, Kuchi, Ghostface Killer, Loonatic Loocy, CrackHer Jackie, Total Jen-o-cide, and Megan Havoc are the latest rollergirls to successfully pass the minimum skills tests as required by the Women’s Flat Track Derby Association, the international governing sports body for women’s flat track-roller derby. Interested men and women are encouraged to contact the league to learn about on-going training opportunities to join Oahu’s roller derby ‘ohana as a rollergirl, referee, non skating official, or volunteer. Fans are invited to dress in costume to support their team of choice, and are encouraged to bring a change of clothes for the post-bout slip and slide races. For a door charge of $7 for the general public ($5 with valid military ID), fans can look forward to live roller derby, snacks and a bake sale, live music and the opportunity to join the derby girls in an afternoon of fan-appreciation field day games, relays, and races after the on skates action. All funds raised support Pacific Roller Derby’s efforts to purchase a sport court so they can find an indoor venue to call home, and the organization’s operating expenses. Pacific’s Hideaway scrimmages are family friendly events through 8pm when it becomes an 18+ event. Doors open at 3:30pm and the first whistle blows promptly at 4pm at the caged tennis courts at the USCG Air Station’s Hideaway Bar, at 1 Coral Sea Street. Fans without a military ID must RSVP at www.pacificrollerderby.com by 5pm on Friday, May 13, for entry onto the base, or must be sponsored by a military ID holder. For further questions and inquiries, and to learn more about the Pacific Roller Derby or how to become involved with Oahu’s premier roller derby league, fans are encouraged to visit www.pacificrollerderby.com. In 2008, Pacific Roller Derby (Pacific) brought the excitement of roller derby back to Honolulu, Hawaii. The all female flat-track roller derby league has showed fans what it means to push one’s self to their highest potential and form a strong community around one of the world’s fastest growing female dominated sports. As members of this league we continue to keep the enthusiasm alive and spread the derby love. In 2009, Pacific became a member of the Women’s Flat Track Derby Association (WFTDA). WFTDA promotes and fosters the sport of women’s flat-track derby by developing athletic ability, sportswomanship, and goodwill among member leagues. Pacific is excited to learn about local sponsorship opportunities and about local venues to call home for their on-skates events so they may continue to spread roller derby’s popularity around the island. For more information, visit www.pacificrollerderby.com.